Mackie 'up the ante' once again by squeezing eight channels of their class-leading preamplification and A-D conversion into a 1U rack. The market for straightforward, multi-channel mic preamps has grown considerably in recent years as more and more people have grasped the idea that the best way to use digital recorders and DAWs is to record all sources without processing, and then to process them as necessary during the mixing stage. Thus high-quality front ends are big business these days, covering every possible variation from mono recording channels to multi-channel preamps like the Mackie Onyx 800R reviewed here. Mackie have packaged eight of their latest Onyx preamps into a surprisingly heavy 1U rackmount box, along with a high-quality eight-channel A-D 24-bit/192kHz converter and several useful 'bells and whistles'. The preamp circuitry is taken directly from the Onyx-series mixers, which incorporate a new mic preamp design claimed to 'meet or surpass the fidelity and dynamic range of ultra-expensive' stand-alone preamps. This Onyx design builds upon the acknowledged quality of the previous VLZ XDR preamps, to provide greater transparency, lower distortion, more headroom, and a slightly larger-than-life character. The 800R is housed in a relatively deep 1U case which extends 325mm (12.8 inches) behind the rack ears and weighs nearly 5kg (over 10.5lbs). The case is grey-painted steel, but the front panel of the unit is a brushed aluminium, with matching sculpted knobs and grey buttons. Power is supplied by an internal 'universal' power supply which can accommodate mains voltages between 100V and 240V AC. The rear-panel connections are well laid out and clearly labelled, with eight XLR mic input sockets which, when viewed from behind, go from channel eight on the left to channel one in the centre. A button adjacent to the channel-one input activates an M&S decoder in channels one and two, of which more later. Balanced line inputs and balanced analogue outputs are presented on two 25-pin D-Sub connectors, wired to the ubiquitous Tascam eight-channel analogue wiring standard. Suitable cable harnesses are readily available, and probably cost less than buying a bunch of separate cables, not to mention being a lot tidier! A front-panel button for each channel selects between the mic and line inputs, so both may be wired permanently to appropriate sources if required. The remainder of the rear panel is taken up with the digital interfaces — the A-D is a permanent feature, not an optional extra as it is with so many other multi-channel preamps — supporting all the standard sample rates between 32kHz and 192kHz, with 24-bit or 16-bit resolution. A pair of Toslink optical ports (complete with dust shutters) provide ADAT-format signals. At the lower sample rates these both provide all eight channels. At double sample rates they are configured according to the SMux II protocol, with channels one to four on one port, and channels five to eight on the other. If the quadruple rates are selected then the SMux IV protocol is used, outputting channels one and two on the first port, and channels three and four on the second. There is no access to channels five to eight via the ADAT ports in this mode. Next is a BNC socket to accept an external word-clock reference, complete with a button to select high-impedance or 75Ω termination modes. Sadly, there is no word-clock output socket, which seems a bit of a shortfall for anyone wanting to use multiple 800Rs synchronised together. It is still possible to synchronise multiple units, but the clock has to come from the DAW or recorder and be distributed to each 800R. The main danger of this approach (which is not pointed out in the handbook), is that if the DAW slaves to its digital inputs (as most do by default), this is an instant recipe for word-clock howlround. Finally, another 25-pin D-Sub socket provides AES-EBU or S/PDIF outputs, and this is wired according to the Yamaha mini-YGDAI digital wiring standard. A point worth noting here is that standard Yamaha DB25-to-XLR breakout cables are generally wired with four male XLRs for the four stereo AES outputs, plus four female XLRs for the corresponding AES inputs. The 800R only provides the outputs, of course, so it would be better to either make your own cable or have a suitable cable made. The handbook provides all the necessary pin-out information. Three buttons above the connector provide various operating modes. The first determines 110Ω or 75Ω source impedance to suit whether the connector is being used to feed AES-EBU or S/PDIF inputs. The second button switches between professional (AES-EBU) or consumer (S/PDIF) status data formats. Although most equipment doesn't seem to care how these bits are formatted these days, it can be a useful facility useful should you need to strip out copy-protection bits from a master created on a consumer DAT machine, for example. The third button configures the connector for dual- or single-wire operation. Most modern interfaces support single-wire connections these days, where each AES-EBU channel carries a pair of signals in the usual way, regardless of the sample rate. 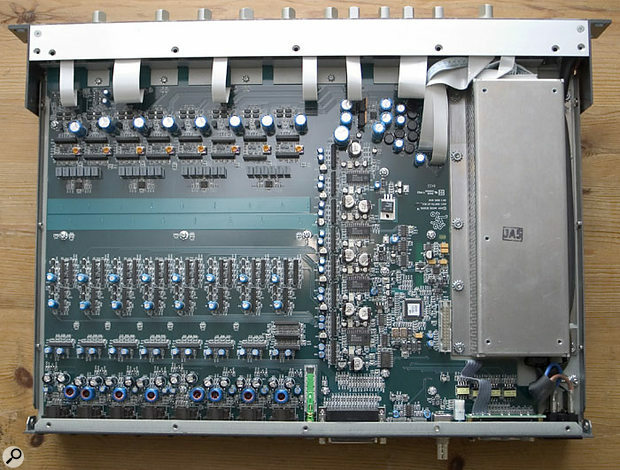 However, older interfaces couldn't operate at the higher rates, so the dual-wire mode re-configures the outputs with only one channel per AES connection. Thus, only the first four channels become accessible when the interface is switched for dual-wire operation at the double and quadruple sample rates. Given the unusually heavy construction of the 800R I felt an uncontrollable urge to remove the lid and take a peak inside. A large, separately enclosed power-supply module runs the full depth of the unit along the left-hand side, and the whole of the remainder of the case floor is covered with a large circuit board constructed almost entirely with surfacemount components. The various subsections of circuitry are clearly delineated, with input stages, control sections, output buffers, and A-D — all with plenty of space and ground planes to minimise crosstalk. Clearly, this is a very carefully designed product with well-specified components and lots of attention to detail. The A-D circuitry occupies an area of the circuit board alongside the PSU, using four high-spec AKM converter chips. The area of real estate employed for this section is far greater than could be accommodated by most plug-in A-D card options I've seen used by most other multi-channel preamp manufacturers, which I take to be an indication of the quality of this design. Moving now to the front panel, each of the eight separate channels share the same basic features and controls, although the first two channels also incorporate a switched input-impedance facility, and the last two provide front-panel DI inputs. The rotary gain control for each channel spans zero to 60dB for the microphone input, and -20dB to +40dB for the line input — the source selection being performed by a grey button adjacent to the control. Three more buttons above each gain control provide phantom power to the corresponding XLR socket, a high-pass filter (turning over at 75Hz with an 18dB/octave slope), and polarity reversal — the last two being functional for both mic and line inputs. Only the phantom-power button has an associated LED: all the others have a white collar at their base which becomes invisible when the button is pressed in. The function of each button is marked on the button cap in a very clear form. A trio of LEDs above the buttons give an indication of signal level for each channel, with green for signals exceeding -20dBu, orange for signals exceeding 0dBu, and a red O/L LED for when the signal gets to within 3dB of clipping. I mentioned earlier that the first two channels incorporate an M&S decoder, activated with a button on the rear panel. So, if you choose to set up an M&S microphone array using a forward-facing omni, cardioid, or hypercardioid mic, together with a sideways-facing figure-of-eight mic, you can decode the output to normal stereo by simply pressing the button. The gain of the Sides-mic channel (channel two) effectively controls the stereo width — and because the decoder is immediately prior to the output stage, it is accessible to both mic and line inputs, making it a very useful facility. You could, for example, record the M&S signals in their native format, and then decode them as a post-production process, running the recorder's line outputs through the unit, to control the stereo width as required. However, there are two frustrations with this M&S facility: firstly, the decoder button is relatively inaccessible on the rear panel; and secondly, there is no front-panel indication to let the user know when the M&S decoder is in circuit. I would have preferred this function to be allocated to inputs three and four (instead of one and two), as there is sufficient panel space on these channels to accommodate the extra button. Failing that, an extra pair of LEDs on the panel above channels one and two would have been handy to indicate when the decoder was working — there is already a panel graphic here to remind users which channels should carry the Middle and Sides signals. The first two channels also incorporate rotary switches to select the microphone input impedance — a fashionable facility these days! The four options provide 300, 500, 1300, and 2400Ω — the last figure being the standard impedance provided by the other six mic inputs. Microphones with transformer outputs often benefit from lower input impedances, but there are no real rules — look on this control as a kind of subtle tone control. While talking about impedance, the line inputs are loaded with an undemanding 20kΩ for balanced inputs (10kΩ for unbalanced connections). Channels seven and eight are equipped with a front-panel quarter-inch socket (unbalanced) to accept guitar inputs, presenting a 1MΩ input impedance. A button is provided alongside to activate the DI input when required, and the channel gain structure is the same as that for the line input. The input headroom is impressive for all sources. The microphone inputs can accommodate signals up to +22dBu (with gain at the 0dB minimum), as can the line and instrument inputs (with gain at the -20dB minimum). The balanced analogue output can provide signal peaks to +24dBu. Crosstalk between channels is better than -100dB at 1kHz, the EIN figure for the mic input is -129dBu with a 150Ω source, and the residual output noise at the line output is -102dBu (-113dBFS on the digital output). The overall dynamic range is quoted as better than 123dB (mic input to line output) and better than 113dB via the A-D converter — both very good figures for a device where each preamp and converter channel effectively costs less than £140 in the UK! The left-hand side of the front panel contains the digital converter controls and the mains power button. An octet of LEDs display the sample rate and external clock status, and the mode can be selected with an adjacent rotary switch. When the sample rate is stable, a Lock LED above the switch illuminates steadily — it flashes if there is a problem. Another grey button switches all of the digital outputs between the full 24-bit resolution, or a truncated and re-dithered 16-bit output — a pair of LEDs show the current mode. The handbook provides no information at all about the nature of the dither signal, and I assume it is a simple TPDF application. My own 3U flightcased preamp rack contains the slightly unusual combination of a GML four-channel mic preamp partnered with a Focusrite ISA428 — the GML outputs being hooked through the Focusrite's eight-channel A-D converter board to provide eight channels via AES-EBU. The 800R is, in comparison, a far neater proposition, and it was instantly obvious that its performance gave little away. I have been using the XDR preamps in a Mackie 1402 VLZpro mixer for quite a while and have found them to be remarkably good — not top league, admittedly, but not far off either. OK, so the bottom end doesn't have the solid expansiveness of high-end preamps like the GML, or the slightly warm and cuddly sound of the ISA428's transformers, and the 1402's mix amps and output drivers restrict the headroom (I never run the Mackie desk hotter than +12dBu for that reason). But even so, with care and attention to detail, it is perfectly possible to extract excellent-quality recordings from the XDR preamps. However, these new Onyx preamps certainly represent a step up from those in the VLZ range. The 800R really has bags of headroom — I could drive the analogue line outputs to over +20dBu without any problems at all — and the sound, while still detailed and clean, does have a touch more warmth and bottom-end weight than the VLZ design. Overall the 800R produces a very classy sound which is in a league far higher than its pricing would imply. It's still not GML calibre, but I found myself preferring it over the ISA428 in certain situations where a more transparent, less 'flavoured' sound was required. There were a few odd things about the performance though. I noticed that changing the impedance settings on channels one or two also changed the phase response at the low end — something shown clearly on my DK Audio meter. When aligning the input gain of channels one and two for a stereo source, instead of the expected straight vertical line I saw a narrow ellipse — clear evidence of a phase shift between the two channels — and it turned out that I had one channel switched to 500Ω and the other to 2400Ω. I doubt such technicalities will concern anyone, and I couldn't hear the effect anything like as easily as I could see it, but it was an interesting discovery all the same! The digital outputs are very flexible, with ADAT, S/PDIF, and AES-EBU options, and compared to my reference Apogee PSX100 I judged the converter quality to be extremely good. Using a BCD Jitterbug, I measured a very good signal jitter figure of 7ns (compared to 5ns from the Apogee). However, I couldn't get full 0dBFS modulation from the 800R's digital outputs, as either the preamp or converter input stages appeared to clip at -0.5dBFS. I suspect this is actually an internal calibration error, but it is disappointing nonetheless. If you are relying on the digital meters of your recorder or DAW, you could potentially be clipping the 800R inputs without knowing it, although in practice — assuming that you leave plenty of headroom when recording — this minor discrepancy won't be a problem at all. Overall, the Onyx 800R is an impressive piece of kit: well built, well specified, classy sounding, and versatile. It has a few quirks and frustrations, but if you need more good-quality inputs for a digital mixer, or an audio interface with ADAT or AES-EBU connectivity, or even a simple rack of eight good mic/line preamps with analogue outputs, the Onyx 800R will fit the bill very nicely. Onyx preamps provide superb sound quality. Flexible digital output rates and formats. M&S decoder and DI facilities. M&S selector on rear panel with no front-panel indicator. This is a remarkably flexible unit in a very compact box. The preamps provide superb sound quality in a class far higher than the price would imply, and the converters translate that quality to the digital domain. Mackie UK +44 (0)1268 571212.